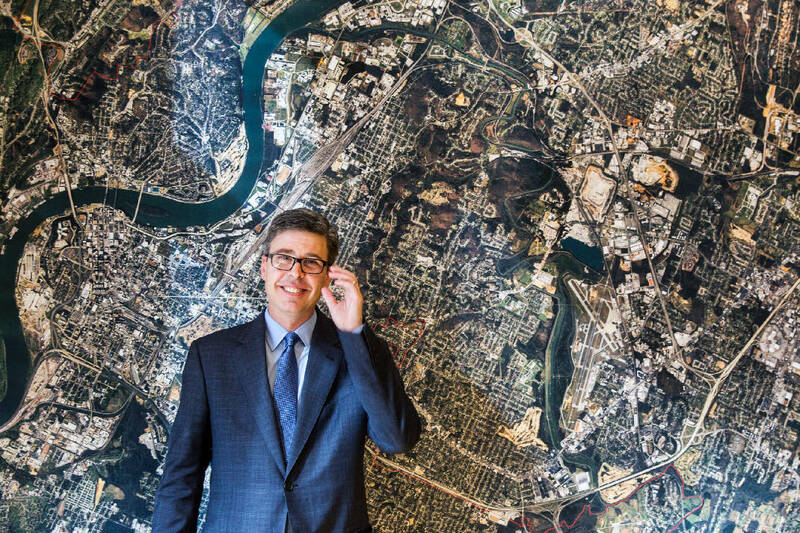 Mayor Andy Berke stands in front of an aerial image of Chattanooga, on the wall of his conference room in this Nov. 17, 2014, photo. Chattanooga is taking a few more steps to make the city safer for pedestrians and cyclists. 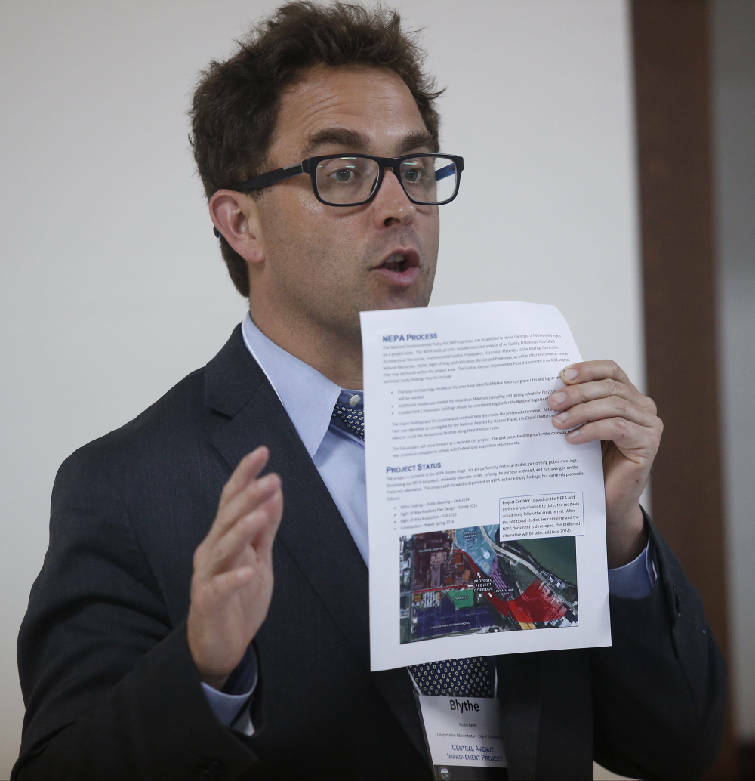 Mayor Andy Berke announced Monday that he would accept a challenge by federal transportation officials to explore new ways to make more of Chattanooga's streets safer for bike riders, pedestrians and drivers alike. "We know about one-third of Americans don't use a car. That could be because of finances, that could be by choice, or that could be because of a disability. We have no reason to believe Chattanooga is any different," Berke said. Chattanooga transportation administrator Blythe Bailey holds up a sheet detailing the National Environmental Policy Act process during a meeting Tuesday, Sept. 2, 2014, at Gethsemane Baptist Church in Chattanooga. In accepting the U.S. Department of Transportation's Mayors' Challenge, Chattanooga has joined nearly 200 other cities, such as Birmingham, Ala., Asheville, N.C., and Lexington, Ky. The good news is, Chattanooga is already ahead of the game. The city has already passed a "complete streets" ordinance, which is one of the requirements of the challenge. And Blythe Bailey, the city's administrator of transportation, said it will begin addressing barriers to pedestrian and bicycle traffic, gather biking and walking data, design and create more pedestrian networks, improve on current traffic laws and educate the public. And all that will happen in one year's time, he said. "Streets with more pedestrians are safer for pedestrians. Streets with more cyclists are safer for cyclists. And a safe street is safe for everyone," Bailey said. Police Chief Fred Fletcher said he views pedestrian safety as one of the department's core duties. "Our job is to protect our most vulnerable, and cyclists, pedestrians and road workers are some of our most vulnerable," Fletcher said. There are no direct grant funds tied to completing the challenge, but participating could put Chattanooga in a better position to receive federal transportation grants, according to Stacy Richardson, Berke's senior advisor. "We will be able to highlight our efforts through the Mayors' Challenge in future grant applications, which we believe will make us more competitive in those particular funding opportunities," Richardson said. Contact staff writer Louie Brogdon at lbrogdon@timesfree press.com, @glbrogdoniv on Twitter or at 423-757-6481.